There is more to the story of Baghdad than one can get from the news of the day. Time was when it was the most advanced city in the world. In science and technology, commerce and manufacturing, intellectual pursuits and dissemination of knowledge, arts and literature, its achievements were unparalleled in east or west. The catastrophe that made all of that a distant memory was equally unprecedented in the history of mankind. It started in 1218 CE. 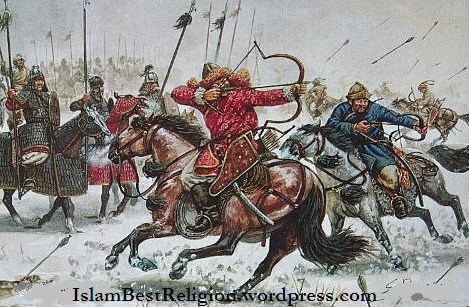 The savage armies of Chengiz (Genghis) Khan invaded and destroyed most of Central Asia and Persia razing to ground such great cities as Bukhara, Samarkand, Herat, Nishapur, and Balkh. He did not attack Baghdad, but paved the way for that invasion by his grandson, Halaku (Hulagu) Khan. In 1258, Halaku sacked Baghdad, killing 1.6 million people in the city and ending forever the signs of the glory of the great city. It was a complete scorched earth policy. They came, they looted, they destroyed, they burned, they killed, they left. The Mongols, as the whole world knows, were savage people. Barbarians. In the 1990s, the land and its people were attacked again. They attacked hospitals and pharmacies, water reservoirs and food warehouses, factories and power stations, schools and orphanages, homes and bazaars. They also imposed a blockade on the country that denied food to the hungry and medicine to the sick. They sentenced everyone in the country to die a slow painful death. Beyond the widespread death (of the innocent men, women and children) and destruction wrought by the invaders that came eight centuries apart, there are other similarities between the two. Chengiz Khan was provoked by a terrible folly of Khwarizm Shah, who had killed 400 Mongol traders on suspicion that they were spies. The invaders in 1991 were also “provoked”, although they used an engineered provocation. Halaku had heard that it would be bad if the Muslim Khalifa’s blood fell on the ground. So he did not kill him with his sword. Rather, the Khalifa was thrown in a sack and clubbed to death, then trampled by the horses. The invaders in 1998 had heard it would be bad to attack during the holy month of Ramadan. So, they started the carnage three days before it. It was aHalakuish display of sensitivity! But Halaku only had weapons of mass destruction. The invaders in the 1990s not only had the most advanced weapons of mass destruction, they also had the weapons of mass distraction—the most advanced propaganda machinery ever developed, in the form of the CNN, the BBC, the Reuters, and other media giants. Halaku lacked it. That is why Halaku never sang “Peace on earth”, while carrying out the massacres. He made no pretensions that he was doing it to uphold “international law.” He did not make any pronouncements that he had “no quarrel with the people”, while putting them to the sword. He did not announce his “respect for Islam” while burning mosques and schools. He was a barbarian! Chengiz and Halaku Khan still rule the world today. Their logic and principles are still driving real-politick. The scene is repeated endlessly in Bosnia and Kosova, Kashmir and Palestine, Iraq and Beirut, Afghanistan and Sudan. But in their latest reincarnation they look so civilized and benign. It is amazing what the make-up artists and spin-doctors of world’s finest propaganda machine can do. It looks pretty, but is no less deadly. This is the unvarnished truth about the world we live in today. Was the Mongol invasion just an accident that happened because of a blunder by Khwarizm Shah? While a superficial reading of history may make one think that it was, reality is entirely different. Forces of evil have always been present in this world and will remain so, but they become dominant only when the forces of good become weak due to internal problems. We can see the big problems in the Muslim world of that time that were the real cause of the tragedy that followed. First was the infighting. Khwarizm Shah had spent most of his time and energies fighting with the Ghauris and other Muslim rulers in neighboring territories. The sons of the great Sultan Salahuddin fought among themselves. The governors of Makkah and Madinah were engaged in a battle between them. Alqami’, the vizier of Musta’sim, the last Abbasid Khalifa who was killed by Halaku, had conspired against the Khalifa. Then there was this love of money and the worldly pleasures. Everyone was busy raising his standard of living. Corruption was common. People were given to music and entertainment, pomp and show, conspicuous consumption, and vain pursuits. Khalifa Musta’sim himself was more interested in hunting and entertainment than the affairs of the state. There is a telling report about Badruddin Lulu, the ruler of Mosul, who once received two requests. Khalifa Muta’sim had asked him to send musical instruments and singers. Halako Khan asked for cannons and other weapons used for demolishing castles. And while all this was going on, some religious leaders were discussing who was superior: Ali Radi-Allahu unhu or Muawwiya Radi-Allahu unhu. After taking Baghdad, Halako marched toward Syria and Africa. Everyone who came in his way was routed. He seemed so invincible. But in 1260 CE at Ain-Jalut, in Galilee, the forces of Sultan Baibers handed him a terrible defeat. The inspiring force behind the Sultan was Sheikh Izzuddin, a great scholar and reformer who urged the Sultan to move on and turn back the Mongol tide, and who himself participated in the jihad. His inspiring sermons brought the Muslims back to Islam by the thousands. When a people turn to Allah, Allah’s help turns to them. Within two years all of Syria had been liberated from the Mongols. What is more, due to the great work of dawa carried out by the great scholars of that time, within forty years of Halako’s invasion of Baghdad, his descendants had accepted Islam. Today the moral and political picture of most parts of the Muslim world does not look much different from the one at the Baghdad of 1250s. Our tragedy is the same. The way out of that tragedy is also the same. If only we would reflect.